We hired Pahsa to DJ our wedding and we received dozens of compliments on the music and requests for his info from our guests. For our reception, we wanted tons of energy and non-stop dancing and he delivered! The dance floor was packed all night. From the beginning, we were struck by how detailed and professional Pasha was about everything. We discussed the “vibe” we were going for with our event (for us, it was a mix of hip hop, pop, and Latin music). He asked about every detail we were planning (How everyone would be announced…full names, first names, etc. What was our cake cutting song? What was our final song? What was the color scheme of the wedding?). We frankly hadn’t even thought about any of these questions…but Pasha had everything planned to deliver exactly what we had imagined. On top of everything, he is just the nicest guy and great to work with. We highly recommend Pasha for any event and already have. You know you’re going to have fun at your own wedding, but the way we knew that Pasha was the right choice was that multiple guests asked for the playlist afterwards. Thanks Pasha! Going back to the end of 2016 we received a call from a mom who was referred to us and needed help. 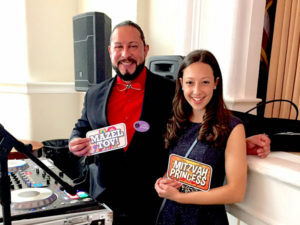 Being a single mother, she was stressed about planning her daughter’s Bat mitzvah due to the fact she was doing it all on her own. The responsibility of what she thought she had to do and the money it would take to do it. From our first call, I could feel the nervousness in her voice. We immediately set up a meeting at the venue for the next week and ensured her we would make it happen and focus on what is most important to their family. Our meeting was so much fun, our Bat Mitzvah girl was a singer and dancer so we focused on who she is and that became her theme! We planned a Broadway Musical theme with songs from her favorite shows for cocktails and lunch. We also convinced Chloe to sing at her Bat Mitzvah to show and share her talents with family and friends. DJ Pasha customized the dance sets and games to reflect Chloe’s likes, not just what everybody does at typical Mitzvahs. This created an amazing daytime dance party! We planned our very own red carpet photo booth to take pictures at the exact times guests could utilize. Most money is wasted at Mitzvahs on the incorrect timing and use of vendors. At DJ Pasha Entertainment we coordinate every investment our clients have purchased into our timeline. We saved our Mother and Daughter a lot of money and stress but most importantly created a day they will never forget. 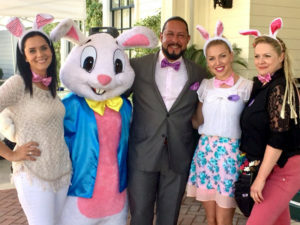 This year DJ Pasha Entertainment was welcomed back to the Valley Hunt Club for their annual Family Easter Festival. The entertainment provided was our adorable friendly Easter Bunny, 2 face painters, 2 balloon twisters, 3 separate petting zoos, and our new addition to the club a trackless train offering parents and kids rides together. We decided to place the trackless train in the center entrance, taking guests on rides around the round about. This created such excitement as guest arrived and once doors open the train was off and never stopped. Last year we had a 6-count pony sweep for kids to ride but wanted something for everyone and we nailed it. So much, they have asked us back for a 3rd year and have taken our advise to add one of our talented DJ performers to make announcements and play good vibes for all ages to enjoy the beautiful Easter morning.